Beth-shean is mentioned only a few times in the Old Testament. The English Standard Version uses both Beth-shan and Beth-shean for this town. Other English versions use a variety of spellings including Bethshan. During one of my recent trips to Beth-shean I sat in the Roman theater and thought about the show of history that passed before my eyes. In the distance was the ancient tell, called Tell el-Husn or Tel Beth She’an, from which one has an impressive view of the area. Occupational levels date back at least to 3000 B.C. Artifacts from Canaan, Egypt, Anatolia, north Syria, and Mesopotamia have been uncovered from the mound. For many Bible students the first event that comes to mind is the defeat of King Saul at the hands of the Philistines. After his death on nearby Mount Gilboa, Saul’s body was taken to Beth-shean and fastened to the wall of the city (1 Samuel 31). View of Tel Beth-Shean from the Roman theater. Photo by Ferrell Jenkins. During the Greek period the city was named Scythopolis (city of the Scythians) and expanded to the foot of the tell. In 63 B.C. the Romans, under the general Pompey, made the city part of the Decapolis (a league of ten cities; Matthew 4:25; Mark 5:20; 7:21). This was the only city of the Decapolis west of the Jordan River. The city was populated by gentiles, Jews and Samaritans. The city grew to its largest size during the Byzantine period as a “Christian” city. It came under Muslim control in A.D. 636, and was destroyed by an earthquake in A.D. 749. The destroyed Byzantine city lies between the theater and the mound. That’s a lot of history in one small place. 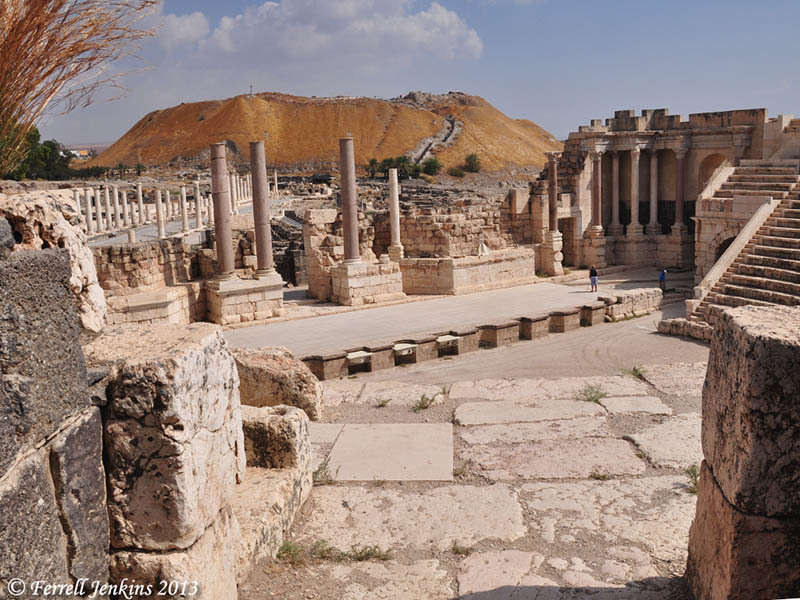 This entry was posted in Archaeology, Bible Places, Bible Study, Israel, New Testament, Old Testament, Photography, Travel and tagged Muslim, Samaritans. Bookmark the permalink. It would be amazing to see a show there! I love reliving history. Here is a picture of ruins from one of the cities of Decapolis mentioned in the New Testament. Since these ruins are from the Roman period, they are contemporary with Jesus. Of course Jesus was hardly impressed with the pompous works of mankind unlike His disciples who marveled at the large stones of Herod’s additions to the Second Temple. “All these things will be thrown down” was His verdict of the splendid yet Godless Jewish religion. He did however call some to Him and began to build His church, the one body that is visible only to Himself, starting at Jerusalem. Later Gentiles would be included since He cleansed their heart through faith in Him. Thanks, Ferrell, for this informative post on Beth-shean. I appreciate your work.